UFC Fighter Has A Loyal Support in High School Fan! Recently, the UFC cut 16 fighters from their growing roster of over 400. Immediately social media sites latched on to one marquee name, Jon Fitch, who was ranked #9 in the division. The decision to remove Fitch from the roster, as we reported, and Dana White confirmed was purely financial. With his longevity in the promotion Fitch made a significant purse, and at #9 in the division and coming off a loss, he was a long way from any title shot, or even significant contention. The other fighters that received the hangman’s sentence seemed to be based on performance. With one glaring exemption. Paul Sass (13-2 MMA) and owner of one of the sickest triangle chokes in the history of MMA, burst on too the UFC scene as an undefeated submission ace with an extremely bright future. Unlike many fighters, Sass shined under the spotlight. Sass won his first three fights (earning 2 Submission of the Night bonuses along the way!) in the UFC and seemed destined to climb the rankings. Next up for Sass was Matt Wiman, in his home country of England. Unfortunately Wiman was able to secure an arm, and forced the Brit to tap in front of the Nottingham crowd. 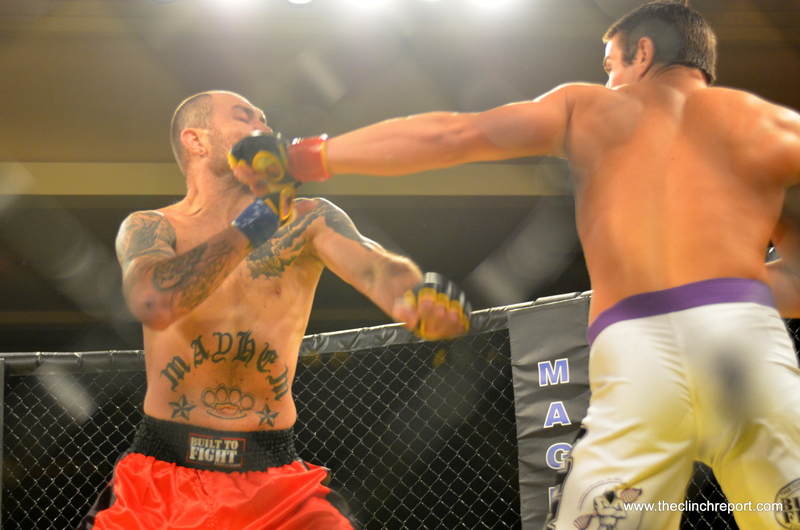 In his next fight, Sass faced the grinding assault of Danny Castillo. Castillo utilized his size and superior wrestling to smother the submission game of Sass, earning him the unanimous decision. The consecutive losses, and sheer size and depth of the lightweight division obviously contributed to the decision to remove Sass from the roster. However it seems to many to be very premature to many fans, prompting some to create social media pages dedicated to demanding Sass’s return to the UFC. The Clinch Report was contacted by a high school student from New York named Matthew Castella who created a social media site asking for Paul Sass’s return to the UFC. Please check out the link below to join the cause! started by Matthew Castella a high school student from Long Island New York. 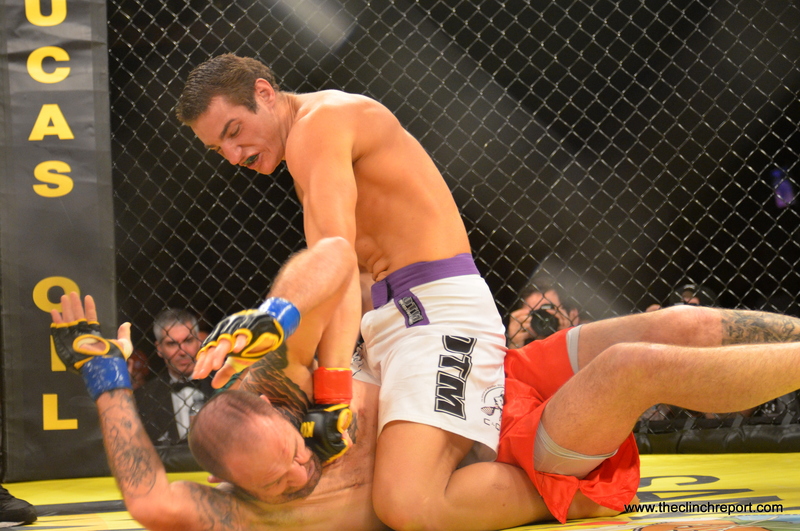 Bellator 89 on Spike TV Continues Successful Trend! Once again Bellator live on Spike TV delivered solid numbers, with regard to viewership. Eduardo Dantas made his return to the Bellator cage to defend his bantamweight title against his friend and mentor Marcos Galvao. The event peaked once again at over 1 million viewers. Since debuting on Spike TV, many critics of the promotion thought the initial success was due to the stacked first card. Many thought after the Chandler and Curran title fights, that viewership would fall sharply. They thought the promotion would not be able to keep the fight cards as exciting or interesting to a TV audience. Once again, after the fighters took control the doubters were silenced. Fireworks and emotion highlighted a very underestimated fight card, and the viewership backed that sentiment up. Former WEC champion Doug Marshall had arguably the best highlight of the evening, when he knocked the taste out of Andreas Spang with a vicious right hand. The KO puts Marshall in excellent position for a title shot as the middleweight tournament rolls on! Of course the highlight of the night was the emotional title fight that saw life long friends square off for the bantamweight championship. Marcos Galvao won the opportunity to fight for the belt, but knew it would be difficult fighting his friend. Dantas, also was emotional both before and after the scrap, refereeing to Galvao as a mentor, and teacher. The fight was very exciting and seemed to be pretty evenly matched until a second round uppercut that scrapped the mat, dropped the charging Galvao. Taking advantage of his prey, Dantas swarmed with hammer fists forcing the stoppage! The impressive win will do much to erase his out of promotion loss to Tyson Nam in his last fight. Now with three division champions that possess dominate wins over tournament challengers, the Bellator product seems secure. The top fighters are starting to create large fan bases based on their longevity as champions! The partnerships with Spike TV, and TNA seem to be not only working, but seem to exceed expectations from both critics and allies the like. By creating their own path, they have secured a niche in MMA, one that continues to offer a bevy of exciting fights, for free. MMA Elite having some fun! MMA Stars doing the Harlem Shake. The guys at MMA Elite always have fun, and once again they make us all laugh! Perfect Timing Makes Everything, well Perfect! The moment Daniel Cormier finished Dion Staring the Strikeforce promotion ceased to exist The roster of over 70 fighters was left wondering who was going to be kept and who was going to be released. At first, only a few names were mentioned including Ronda Rousey. Later an official roster was released to the press, however more names were supposedly going to follow. Many fighters were waiting for that call from their manager, the call they have been dreaming about since they first began hitting the bag. Every fighter dreams of getting that call from the UFC. For Long Island MMA Fighter Ryan Laflare, that call never came. But his phone did ring! Let’s go back two and a half years, when at 6-0 LaFlare was the reigning(and still is) Ring of Combat welterweight champion. Back then the future was guaranteed, for the young fighter who was destroying his opponents wherever the fight went. That is when Ryan Laflare’s phone began ringing. With the UFC in his sights, LaFlare signed with the Strikeforce promotion, which would eventually be bought by ZUFFA (parent company of the UFC). With an unblemished record, and big fight contract LaFlare seemed to be on the verge of greatness. Then the injuries started mounting. While training for his debut Stikeforce fight LaFlare sustained an injury in training that forced him to withdraw from the fight. With a guaranteed deal, it seemed like only a speed bump. However soon after the injury, the Strikeforce promotion began having major issues with their television contract with Showtime. After it was announced that Stikeforce was closing its doors, LaFlare found himself in a very difficult situation. So he returned in January to The Ring of Combat promotion, and again finished his opponent impressively. Although he was signed under the ZUFFA umbrella, he never had the opportunity to show his skills on the big stage. He was not alone, this heaved several careers into limbo. Slowly, the UFC began announcing fighters that were coming over. Big name fighters like Gilbert Melendez, Daniel Cormier, KJ Noons, Ryan Couture, Tyrone Woodley, and many others were immediately mentioned, but still no word about LaFlare. 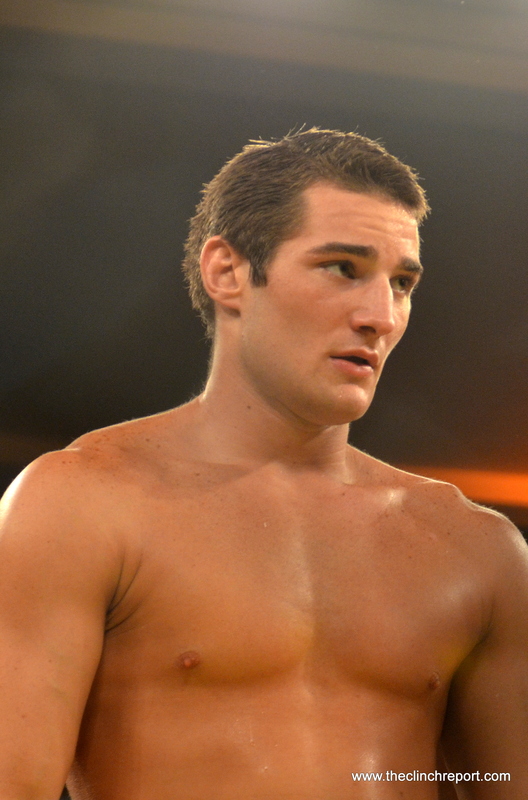 Then it was announced that his teammate and training partner Gian Villante had been added to the roster. Still, no word on LaFlare. Finally, LaFlare heard from his management Glen Robinson. The burgeoning promotion run by Rey Sefo The World Series of Fighting wanted badly, to have Ryan fight for them. With no other better options, they signed the deal. Then it was announced that he would be fighting UFC veteran Josh Burkman in his WSOF debut. Last week, a very upbeat LaFlare expressed how excited he was to be fighting Burkman. “Its the biggest fight of my life, this fight means everything.” LaFlare said. 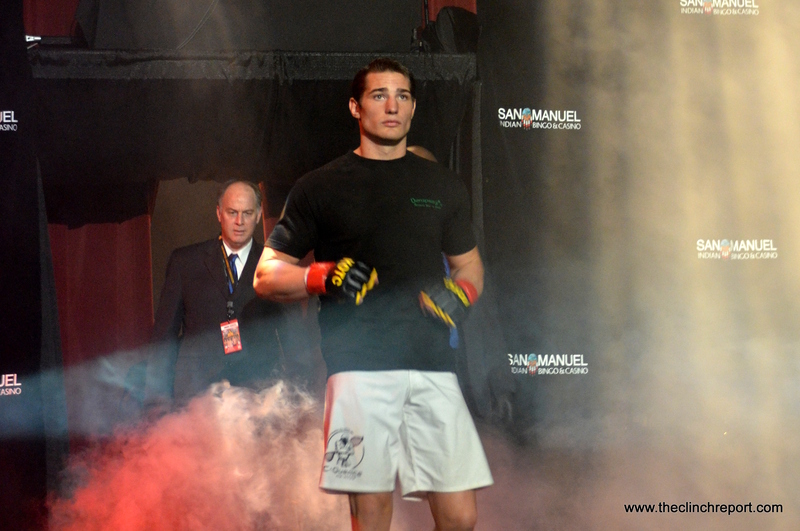 Although not the UFC, the young long islander beamed at the chance to fight a big name such as Burkman. However, the roller coaster ride of emotions had just begun. First, LaFlare and his lovely bride found out they were expecting his second child, a boy. Just when he thought his smile couldn’t grow anymore, the phone rang again! On the other line was his manager Glen Robinson. He told LaFlare that unfortunately he could not fight Burkman, or even for WSOF at all. It seems that once the match-makers at the UFC realized that they were at risk of losing LaFlare for 4 fights, they decided to retain his contract. They announced that his first fight would be in Sweden, against TUF ‘The Smashes” alumni Ben Alloway. For LaFlare the opponent is not the issue, “Im just glad to be in the UFC, I’ll fight whoever they want me too!” LaFlare said. With his immediate future set, LaFlare will join his fellow training partners Villante and Dennis Bermudez in the talent rich UFC roster, while Marcos Galvao continues to turn heads in the Bellator organization. Between these three at Long Island MMA/Bellmore Kickboxing Academy and the talent coming out of the Serra/Longo fight team, Long Islands future in this sport seems set for some time to come. With his first son on the way, a new UFC contract in his pocket Ryan LaFlare can finally stop waiting for the phone to ring. Its never been about the work, as an athlete LaFlare’s work ethic is strong. Opportunity was the only piece of the puzzle missing, and now that the picture is complete, LaFlare can enjoy some of the fruits that his hard work has ensured. Make sure all of you MMA fans, sign up at this website to help end the reign of political terrorism against our beloved sport. The only reason the sport is still illegal is because of a Culinary Union lobby that has issues with Zuffa (Company that owns the UFC), and their interest in the union-less Station Casino’s in Nevada. Hopefully the stench that this shady operation has caused, may finally be reaching the right noses. We shall See! The Clinch Report is building our Army, and hope that both Fighters and Fans the like join our site. We will be choosing one fighter a month to be our featured fighter. The featured fighter will receive a full Bio, and write up that will be marketed in every blog, forum, and fight page that we are members of. Every fighter needs exposure, well now you have a chance to win some! For the fans, we will giving away signed merchandise and MMA swag that we have been accumulating over the years. The first giveaway will be a signed Tito Ortiz Official UFC Fight Glove. Who wouldn’t want a free chance to own a former UFC world champions signed fight glove? When the drawing is completed the winners will be contacted. Get the word out, and follow http://www.theclinchreport.com for your chance to win! MMA Two Weeks Away from MSG? Finally ZUFFA (The company that owns the UFC) lawyers were able to achieve a major break through with regard to the legalization of MMA in the State of New York. By exploiting a loop-hole the UFC could begin staging events at the Combat Sports Mecca Madison Square Garden within 2 weeks. The loop-hole allows certain promotions that were grandfathered in, to sanction events. The UFC would have to partner with one of these promotions, but could do so within 2 weeks. Its not an ideal situation for the UFC, to have to partner for a New York event. However it is a start. Zuffa has been embroiled in a long standing battle of attrition with leaders of the Culinary Union over the allowance of union employees in the Zuffa owned Station Casino franchise. Basically a politically strong union is using its clout to prevent an entire sport from being legal, because of a personal beef with one organizations ownership group. This gross and obvious cave in to a powerful lobby forced several fighters and the UFC to file suit against the State of New York’s Attorney General. Not only was this loophole exposed, allowing for MMA in New York, the judge ordered the UFC and the district attorney to settle their issues. Leaving many to speculate that legalization is likely in the near future. For now though, it seems likely that these loopholes will be exploited in the meantime. This is great news for all MMA organizations, and fighters. Madison Square Garden or MSG for short has been the combat sports capital of the world for years. The marquee has spotlighted boxing and wrestling champions that have defined generations. Men like Hulk Hogan, Mohammed Ali, Jake LaMotta, Bruno Sammartino went from headliners to lunch box covers, and commercial spokesmen. With boxing, pro wrestling, amateur wrestling, and martial arts tournaments already showcased, the State commissions influence is an obvious repulsion of politics. Even the most naive UFC fan, knows that crooked politicians in New York are the reason why MMA is illegal. Basically this is Zuffa beating both the crooked New York politicians and the disgusting Culinary Union Administrators at their own game. By punishing an entire organized sport, because of one organizations outside policies (when its not obviously an abhorrent policy, they don’t allow unions, like many other companies!) this political pool of pis-ants, have created a tremendous stench. One that exposes their very practices. If you care to view the entire documentation of the judgment you can check it out here! Wrestling No Longer an Olympic Sport? Growing up wrestling was a huge part of my life. I was not very good, and i didn’t compete after the age of 15, but as a young athlete wrestling instilled an unrivaled work ethic . Wrestling is about sacrifice effort, and determination. The grueling practices and nagging injuries are rewarded with starvation and dehydration just to qualify for competition. The sport ensures both the thrill of victory, and the agony of defeat. Since 1896, men have competed at the highest level in wrestling. Not as paid athletes, only professorial wrestlers get paid, and they are compensated for scripted entertainment, not for competition. The Olympics is the top of the pyramid for a wrestlers ambition. Rulon Gardner, Jeff Blatnick, Dan Gable, Alexander Medved, Alexander Karelin, and numerous others became national heroes under the Olympic umbrella. However, after 2016 there will be no more wrestling of any kind at the Olympic games. A recent secret ballot, eliminated wrestling (both Freestyle and Greco-Roman) from the “core group” of sports, in order to make room for Rugby and Golf. The elimination of wrestling was favored over the less popular modern pentathlon, which I challenge any reader to name the categories without first looking them up! So what does this mean for the sport as a whole? Will this deter wrestlers from pursing the sport, since the ceiling for the sport has been lowered significantly? What will the consequences of this horrible decision be? Wrestlers are the way they are, because competitive drive is rooted in their very marrow. In school, wrestling offered little reward for a lot of sacrifice. However they still work just as hard, in front of empty bleachers, with no fan fare, or headlines. Scholarships now will probably decrease, since the Olympic elimination, but I am willing to bet the wrestling rooms will be just as full. With MMA on the rise, wrestlers have options. And the work ethic they learn slamming 90 lbs dummies, is perfectly suited for the discipline needed in that sport. Wrestlers no longer need the Olympics, however I am pretty sure the backlash that results from this decision will prove to the IOC, that the Olympics are the one who need wrestling. Addition by subtraction is not always addition. Especially not with a hundred years of tradition in the rear view mirror! Please Follow Our Website for a chance to win! Aveles combination later, not so much! 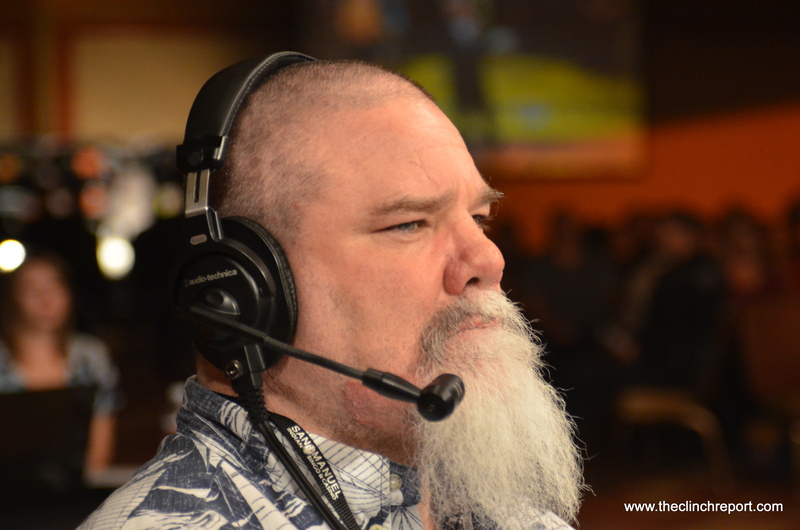 Once again all hell broke loose at The San Manuel Indian Casino(follow @SanManuelCasino on Twitter), during The King if The Cage Restitution event. The fighters performances shadowed a late minute main event cancellation that threatened to put a damper on the evening. Nick Rossborough injured his back in training and was unable to compete against heavyweight champion Tony Lopez. Unable to find a replacement, the bout was scraped leaving the fight card one title fight short. However once the show started and the fighters took control, the performances produced a virtual highlight reel of fight footage. In the opener Marcelo Mafra utilized his dominating wrestling and ground game to control a very game Joshua Miranda who was on the defensive and his back for most of the fight. The effort earned Mafra a unanimous decision victory. 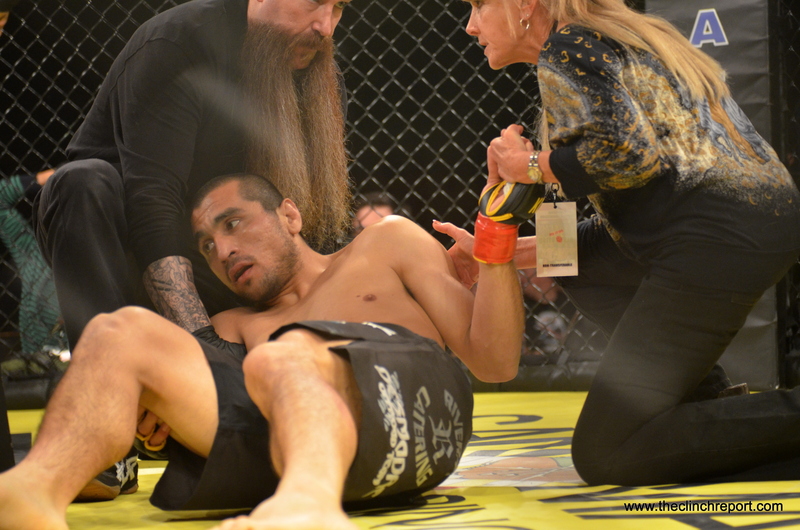 Daniel Hernandez needed only 1:20 to secure a guillotine choke submission victory over Kenny Ento. After an aggressive take down by Hernandez, Ento exposed his neck allowing Hernandez to pull a chancery position that he parlayed into the choke. Hernandez has looked dominant in past few fights. His dominant wrestling and heavy hands have to be drawing some stares from fellow 185lbs contenders. The third fight was over in a heartbeat. Carlos Ortega landed a huge left hand that immediately staggered Charles Lee. Lee on his bicycle, tried to create space to regain his composure but Ortega swarmed. A heavy right hand from the stalking Ortega dropped the wobbled Lee, forcing the referee to interrupt some rather academic ground and pound. After a few quick KO’s, Vince Alaalatoa and Manny Murillo change the dynamic by treating the audience to a tightly contested battle that left both combatants bruised, bloodied, and swollen. In the end, Murillo utilized his clinch game, and dirty boxing to secure a tightly scored split decision. Alaalatoa valiantly rallied late in the third round, with a flurry of straight lefts and rights, that staggered Murillo who seemed to be on the balance beam when the final bell rang. After that grueling fight things returned to form as Alejandro Garcia needed only 3:54 to knockout heavily favored veteran Roberto Vargas. Garcia frustrated Vargas from the opening bell, and snapped cracking leg kicks one after the other keep Vargas out of range. After a right hand, leg kick combination Garcia reset, and unleashed a devastating leg kick to Vargas’s front leg that swept him off his feet. Garcia pounced on the downed Vargas, and took his back. Once he flattened Vargas out he began to pummel the sides of his head with left and right hooks, from the back mount. A big right hand sapped Vargas, and the referee stepped in stopping the fight. A huge win for Garcia, and a tough loss for the journeyman Vargas. In the co-main event, Joshua Aveles survived and early take down from welter weight champion Sam Liera, by quickly popping back up to his feet. Liera still with his back, unsuccessfully attempted to suplex Aveles back to the mat, however Aveles broke free and returned to his Muay Thai foundation. Surviving another clinch, and brief take down Aveles stood and landed a huge left hand on the exit that had Liera out on his feet. The right hand that followed ended all doubt as Liera fell prone to the canvas clearly unconscious. 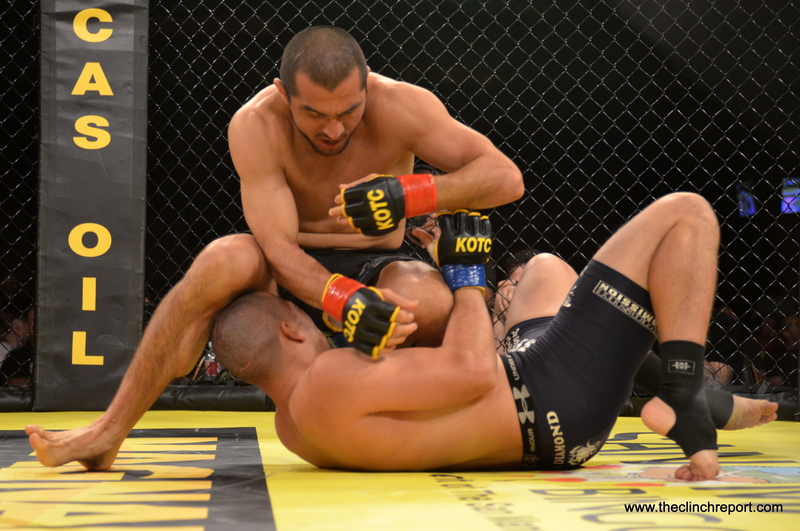 The win earns Joshua Aveles the KOTC Welterweight Title, and adds to his impressive highlight knockout reel. 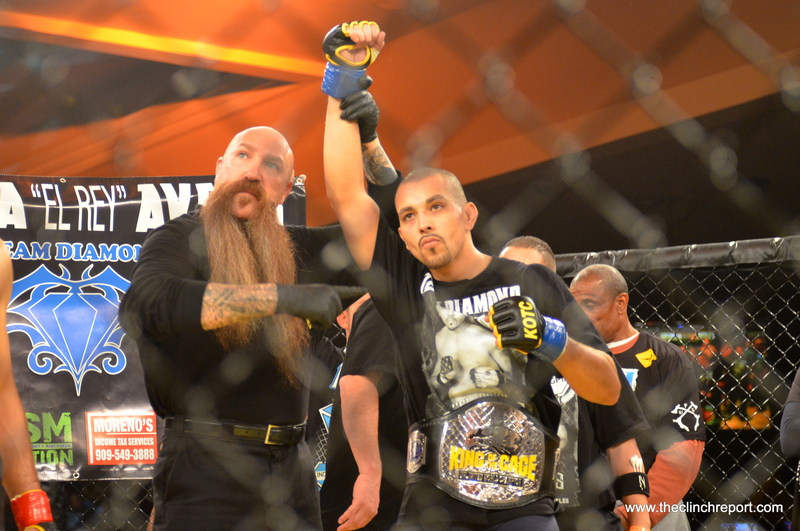 Sean Strickland maybe The King of The Cage’s pound for pound champion. 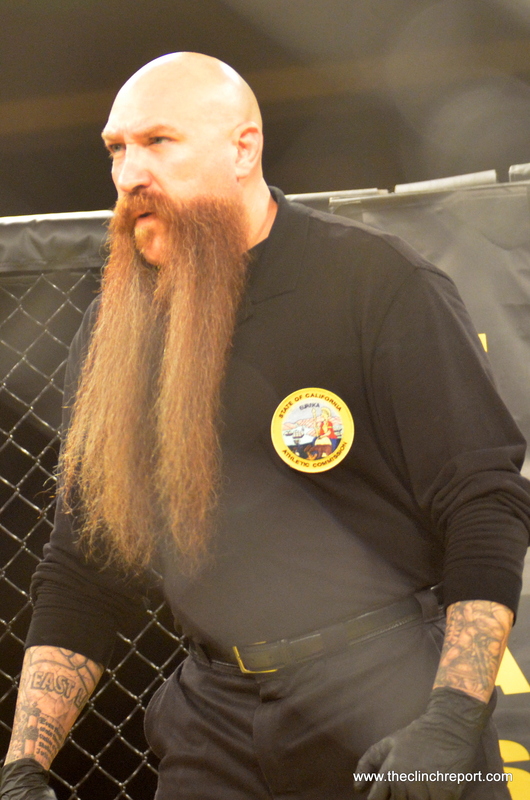 Coming off his first title defense, Strickland was set to face off with veteran striker Bill Albrecht. Both fighters appeared wary of the other. Neither was willing to commit to any sort of combination. Strickland pushed the pace landing a jab, right hand combination that he followed with a take down. Albrecht tried to defend against the mount, but Strickland swiftly transitioned to the mount and began landing powerful strikes that forced Albrecht to cover up. The referee stepped in stopping the fight at 2:41 of the very first round. 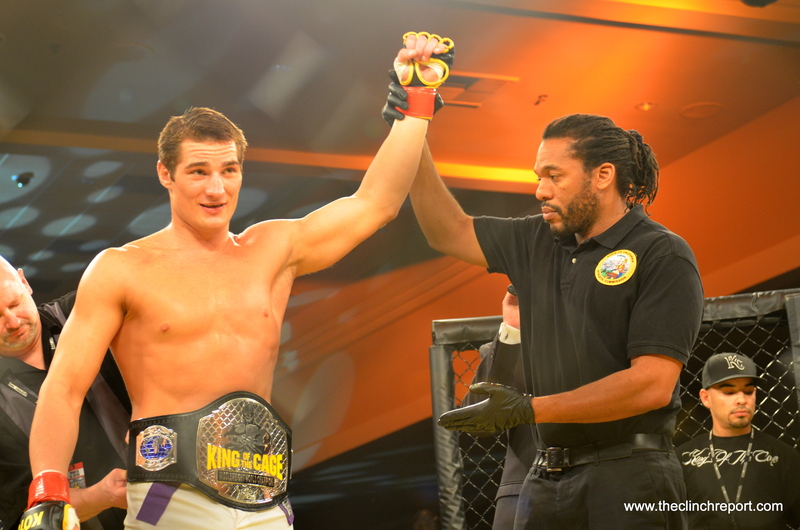 Strickland continues his undefeated streak, and remains the KOTC top prospect, and Middleweight champion. King of The Cage Restitution Live UPDATES! RD 3: Round 3 starts with Miranda instigating the clinch. Mafra jumps on his back, looking for the standing submission, and Miranda drops him on his back. Mafra spins to mount, but Miranda controls the posture very well. Still in mount, Mafra is unable to land any shots as Miranda keeps him close. Again Mafra stands and looks to penetrate the guard of Miranda, who seems content on his back. Mafra again achieves mount but is immediately pulled tight. Mafra finally able to create some space. The last ten seconds of the fight, Mafra finally able to posture up to land some decent ground and pound. 10-9 Mafra. RD 1: Hernandez starts off by landing a big leg kick, followed by a left that briefly drops Ento. Ento looks to jab, as Hernandez shoots. Hernandez able to drop Ento with a big take down, that he immediately parlayed into a guillotine. From his back, the choke looks deep. Ento taps at 1:20 of the very first round! RD 1: Ortega lands a big left hand that has Lee on his bicycle, Lee gets clipped again with a heavy right hand and drops supine to the mat. Ortega follows reigning some lefts and rights from the back mount. Big John steps in at :38 seconds into round 1. RD 1: Alaalatoa starts out by using his reach to land effective jabs. And drops Murillo with a big right hand. Murillo able to get back to his feet, where the clinch begins. Alaalatoa flurries again with rights and lefts, and Murillo circles away. Murillo’s right eye is severely swollen. Murillo is also cut above the right eye. Alaalatoa is able to secure a take down from the clinch, but Murillo is able to sweep and land in half guard. Big elbows from Murillo rain down. Alaalatoa is able to get back to his feet, and the fighters seperate. Leg kicks from Murillo land, on the outside of Alaalatoa’s right leg. Big flurry by Murillo as the round comes to an end. Close round, that started one way, and ended another. Murillo 10-9 with the late flurry. Both fighters appear gassed. Murillo explodes with ones and twos, pushing Alaalatoa against the cage, and lands a heavy right hand before clinching. Another flurry by Murillo is stopped by a stiff Alaalatoa jab. More leg kicks by Murillo, as Alaalatoa counters with the jab effectively. We see another round for Murillo 10 -9. RD 3: Alaalatoa starts out with a big right hand, that pushes Murillo backwards. The fighters clinch briefly and trade punches on the break. Alaalatoa secures a single leg that he is unable to keep. Murillo pushes Alaalatoa against the fence and the two begin hand fighting for control. Murillo in control as the referee calls for action and gets some. Big knees from Murillo in the clinch, as Alaalatoa reverses position, but is unable to land. Murillo misses a big spinning back fist, as both fighters begin to trade shots. Big right hand from Alaalatoa has Murillo rocked, Murillo is on his bicycle with ten seconds left. Both fighters throwing as the round ends. The late flurry for Alaalatoa stole the round 10-9. (29-28, 28-29, 29-28) Manny Murillo via split decision. RD 1: Vargas begins pawwing with the jab. Garcia with a big leg kick. Right hand by Garcia. Vargas looking for his range eats another jab from Garcia who is stalking confidently. Superman punch from Garcia lands, followed by a 3 punch combination that Vargas has no answer for. Garcia fakes the take down and lands a big right hand that drops vargas momentarily. Garcia with a leg kick right hand combination. Vargas appears frustrated. Another vicious leg kick to the left knee of Vargas. Garcia kicks Vargas’s leg out from under and follows with several right hands to Vargas’s head. He appears out, as more punches land Big John steps in to prevent anymore damage. RD 1: Fighters touch gloves, and Liera immediately catches an Aveles kick and drops him with the takedown. Liera takes Aveles back who stands. Liera looking for the suplex, instead uses a full nelson to bring Aveles down. Aveles able to get back up, where Liera looks again for the take down. Big right hand from Aveles, and Liera is hurt, one more and he is out! 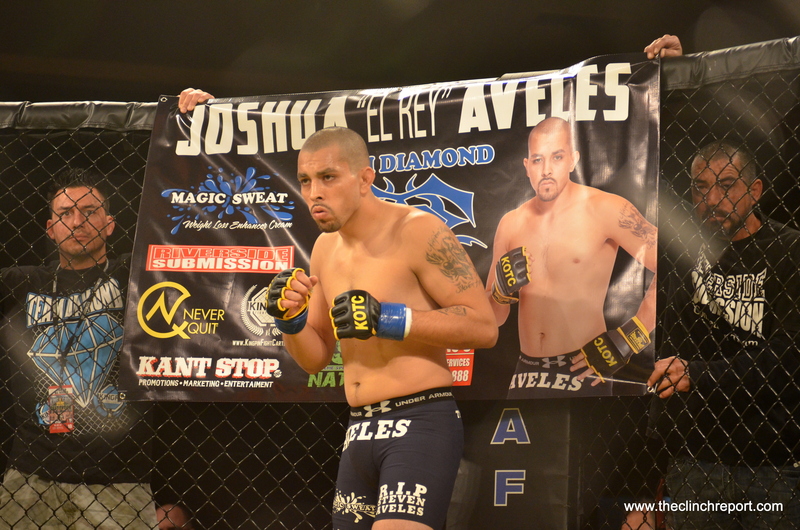 Josh Aveles again with a vicious knockout! Liera is out cold! RD 1: Albrecht starts off the agressor, as Strickland looks to counter. Leg kick by Strickland lands, as Albrecht counters with the jab. Both fighters seems to be landing single shots, not able to string to gether any ominatios But Strickland lands a one, two and immediately secures the take down. The Champion now working in side control. He transitions to the mount and begins the onslaught of ground strikes. After Albrecht “turtles”, Herb Dean steps in to halt the bout at 2:41 seconds of the first round.